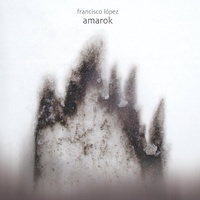 For “Amarok, two years of hard work have been employed using sounds and processed field recordings. After a few seconds from the track beginning we are dipped into an arctic trip which lasts more than an hour and in which tangled weavings in a masterly fashion handled by the Spanish artist appear, develop and dissolve. Gusts of arctic wind, the Amarok’s wheezing breath (Amarok is the name of a gigantic wolf in Inuit mythology) and the sense of loss in the polar night are only some of the sensations that this cryogenic hallucinatory acoustic is able to evoke.